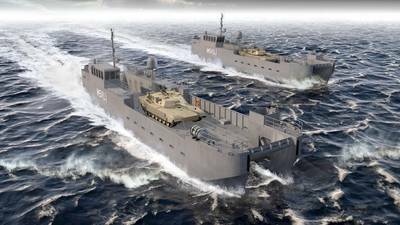 Shipbuilder Vigor has selected Marine Jet Power (MJP) as the propulsion provider for the U.S. Army’s new Maneuver Support Vessel (Light), MSV(L) vessels. Vigor was awarded the 10-year, $979,390,000 MSV(L) contract in 2017 to construct a new generation of landing craft to replace the existing LCM-8 Mike boats. The new vessels will feature triple drive MJP 750 DRB waterjets, constructed from duplex stainless steel and offering the latest advancements in MJP’s proprietary mixed flow technology. The propulsion package has been optimized to fit the needs of the U.S. Army, with an inboard hydraulic system and an integrated electronic control system. MJP said it will begin to deliver units to shipbuilder in Spring 2019. In total, it will deliver 45 shipsets over the next 10 years.